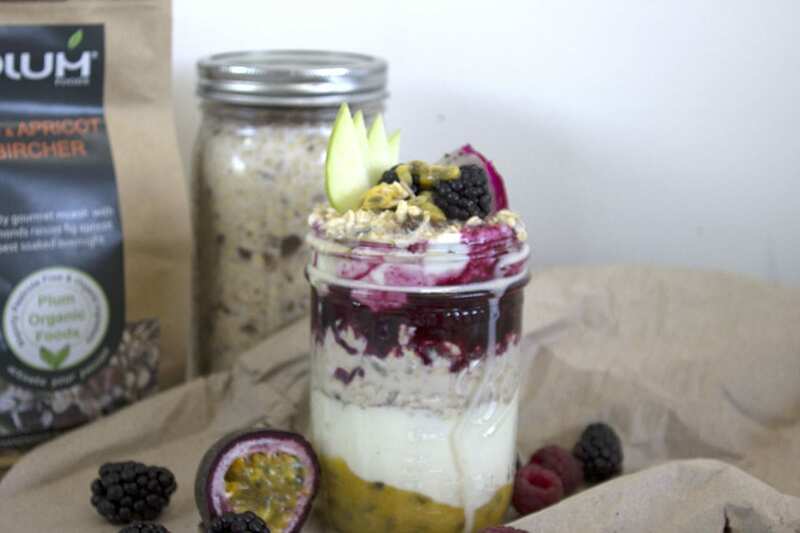 Fig & Apricot Bircher muesli with a berry coulis fresh fruit and Yogurt is a very health easy breakfast based on the Bircher muesli recipe made famous by Dr Bircher’s health muesli. The Plum Foods brand Fig & Apricot Muesli already comes pre-mixed with organic oats some dried fruits and healthy pesticide free Australian Almonds, so you have Dr Birchers Muesli when you simply add milk. However, this recipe calls for some extra fresh fruit and a bigger dollop of protein rich yogurt.